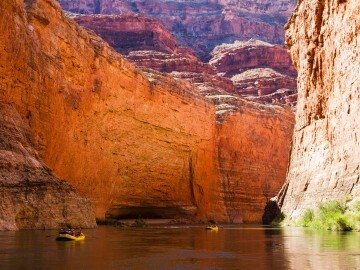 “Among the most notorious of dangers of the American Southwest, second perhaps only to dying of thirst, is its opposite: being swept into oblivion by a flash flood,” writes Michael Ghiglieri in his book, Over the Edge: Death in Grand Canyon. Flash floods are common during the rainy season, also known as monsoon season, which typically lasts from July through mid-September in the desert southwest. Brief, explosive rain showers can result in torrents of water racing towards the lowest point with nothing but desert sand to hold them back. 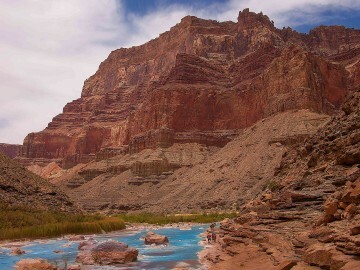 Within hours or even minutes of a brief rain storm miles away, thousands of gallons of water hurl over the cliffs in the Grand Canyon and bottleneck in side canyons creating beautiful waterfalls and dangerous walls of water, mud and debris. 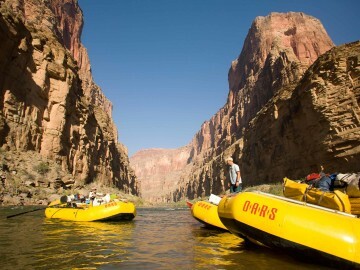 On Friday, August 7th this year, Diamond Creek (which runs along the take out road for most Grand Canyon rafting trips) went from a trickle of only 4 cfs (cubic feet per second) to over 10,000 cfs temporarily shutting down any access to the Colorado River. Fortunately, no one was hurt. Photos and videos of recent microbursts and other flash flooding in the area have inundated the web. But this isn’t the first time Diamond Creek flashed and it likely won’t be the last. “It had been raining off and on, and the sky was dark, but this type of weather is common for the Southwest in July. As we headed up the canyon, Outdoors Unlimited [another Grand Canyon river outfitter taking out at the same time] got stuck in some loose gravel and all the crew members got out of both vehicles to assist in freeing them. 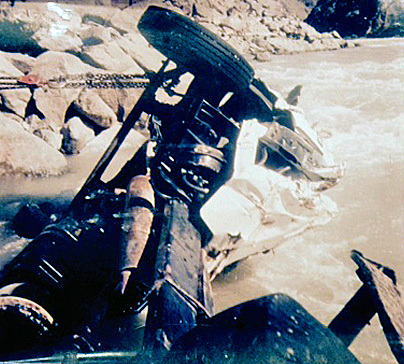 The mangled OARS truck could be seen at low water at the bottom of Diamond Creek rapid. “At this point we were approximately a quarter-mile up from the mouth of the canyon. Just as we got out of the trucks we heard a loud, thundering noise. We thought it was thunder, perhaps a jet, or very likely the large D-9 Caterpillar that had been working on the roadbed earlier that day. Looking upstream, our thoughts turned to disbelief as we saw a 10+ foot wall of water coming around the corner, only 100 yards ahead of us, filling the canyon from wall to wall. 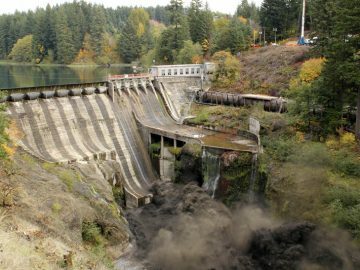 Led by a fury of dark brown foam and a mass of fallen tamerisk, the wall of mud and water careened off the right-hand bank (looking upstream) and raced toward us. Between the two vehicles, there were 9 of us. Instantly, we ran, searching for a way up the sheer granite cliffs. Only 30 seconds had passed since we first heard the noise and saw the wall of water. Looking down from the ledge we’d climbed up, we saw the wall of water first hit the O.U. truck then push it effortlessly for 50 feet toward the OARS truck. When it collided with the OARS truck both trucks rolled over, gear and equipment falling out of the beds. Almost as quickly as they had rolled, both vehicles were engulfed in the onslaught of water, mud and rocks and disappeared from our sight. Thankfully, Dennis and Steve were found; they had climbed up a different way. The crew rescued Debbie and Amy around 10 pm that evening when the water had gone down just enough for them to safely get them out using ropes and carabiners. Detritus from the two trucks and their lost cargo was seen being swept downstream by a third outfitter, AZRA, who amazingly remained untouched near the mouth of the creek. AZRA shared their dinner and some sleeping gear with the rescued crew and the next morning all nine hiked three miles up Peach Springs Canyon where they were picked up by a Hualapai River Running truck. 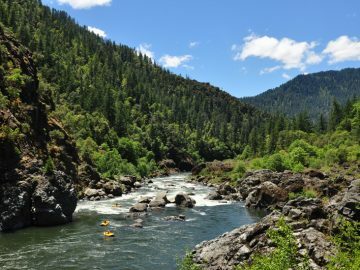 A week later, Ghiglieri was on the next OARS trip to pass Diamond Creek. There, he unearthed several rocket boxes, a cast-iron griddle, a tent fly and steel stakes from the new OARS stakebed truck in a gravel delta created by the flash flood. Ghiglieri writes about the entire event and several other flash floods in his book. Rocket box lids, hand-painted by the OARS food-packer are unearthed in the gravel delta created by the Diamond Creek flash flood. In the end, no one was hurt. 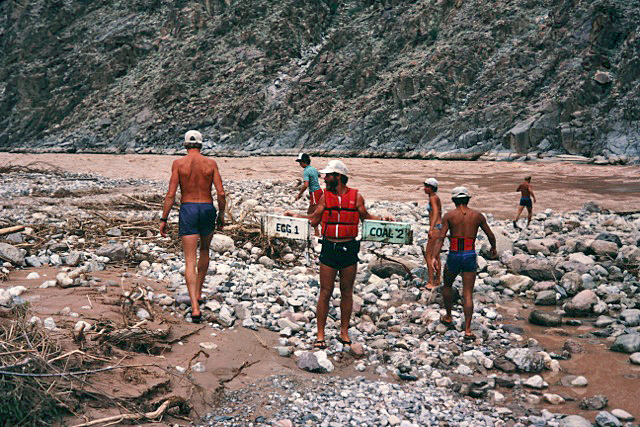 OARS lost its gear truck and all of its rafting equipment necessary for a two-week 6-raft trip. Amazingly, much of the gear including the rolled-up rafts, oars, ammo boxes and waterproof bags floated and was recovered a few days later on Lake Mead – 20 miles or more downriver. One raft was lost but it was found jammed into a silt bank in Lake Mead as the reservoir level dropped in 2013 – 29 years later. 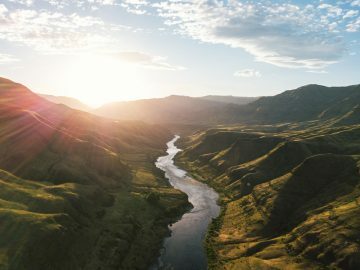 “OARS’ GMC 2-ton stake bed truck ended up on the opposite side of the Colorado River and partway down Diamond Creek Rapid. At very low water, it remains still visible, upside down and missing most of its parts. The nearby camp on the far side of the river over there now is called “Truck Stop,” wrote Ghiglieri. Final photo courtesy of Kelly Bretta.